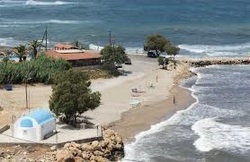 The beach is situated below the bridge Geropotamos at the highway that leads to Heraklion and it is from our hotel 3km.It is a small but picturesque beach that combines sand and pebbles. There are umbrellas, sun beds and a small tavern. Skaleta beach is a long sandy beach lying on the northern shore of the island, 11km from Rethymno city and 700m from Lofos Apartments . There is also a village called Skaleta, where you can find many restaurants, shops, bars and water sports facilities. 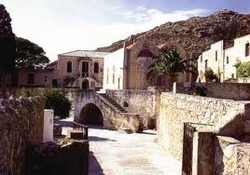 The Arkadi Monastery is one of the most important and historic monasteries in Crete, and was mentioned as early as the 16th century as an important cultural centre. It was sacked in 1646 during the Turkish conquest of the island, but was restored and continued to flourish, as is evident in its architecture, particularly the facade of the church, considered one of the best examples of what is known as the Cretan Renaissance.Other architectural elements include the Corinthian columns, curved arches and pinnacles.It was not, however, for its architecture, that Arkadi has gone down in history, nor for its religious or cultural importance. Above all, it has been associated with one of the most heroic and tragic events in the history of Crete. Eleftherna is the most important archaeological place of the town of Rethymno, which has not been fully excavated. The town was founded by the Dorians in the 9th century BC and it was inhabited until the early Byzantine time . Anogia is a lovely, picturesque and attractive mountainous village, considered as one of the most beautiful and authentic villages of Crete. It is standing at an altitude of 750 metres on Mount Psiloritis, the highest mountain of Crete. Due to its isolation, the village has kept a strong authentic character, the local customs, its traditional costumes and an old dialect. 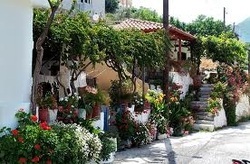 The village of Margarites Μαργαρίτες, is located in picturesque green rolling hills, the village is well known for its pottery, and attracts large tour buses in the busy season. 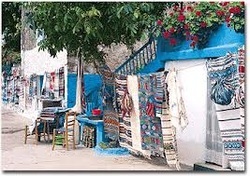 After the rushed tourists have left, it is then possible to stroll around this very charming village and enjoy the many pottery studios. The tradition of pottery goes back many generations in this village and you will be able to find an elder to show you how the pots are hand thrown. 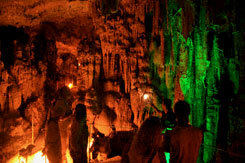 Sfendoni Cave lies in the village of Zoniana in the prefecture of Rethymno. It occupies an area of approximately 3000 m? and is one of the most significant caves in Greece. In the course of its 270 metres, visitors can enjoy a stunning spectacle of massive pillars, creating maze-like chambers with countless stalactites and stalagmites of various forms and colours and numerous stone water basins and cave rosettes. 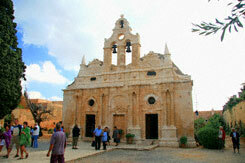 All the above make it one of Crete's most important sights of interest. 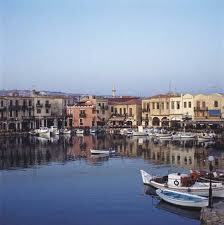 Rethymno is the capital town of the wider prefecture of Rethymno. 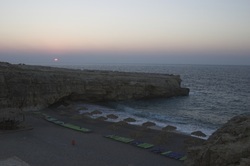 It is located on the northern coast of Crete, at a distance of 80 kilometers from Heraklion and 60 km from Chania. It is a town that uniquely combines the traditional and classy with modernity. The old town of Rethymno is picturesque, with the beautiful Venetian harbor, the castle of Fortezza and its narrow cobbled alleys. Also, there is the Archaeological Museum, the Museum of Folklore and the Religious Museum. The modern city of Rethymno provides the visitors with all kinds of amenities. There are many banks and public agencies, hotels, restaurants, bars and clubs. It is famous for its nightlife and hospitality. In the summer, there are festivities, such as the Renaissance Festival and the Wine Festival. In the Winter, visitors can enjoy the carnival festivity. In Rethymnon, there is a central bus service to take you to other areas of the prefecture as well as to other areas of the island.